Adding numerous contacts into a database is a difficult task as well as cleaning your database. A lot of time should be dedicated just for that task. In Akubo, you can import your contacts from an Excel or CSV file as well as doing an update import. 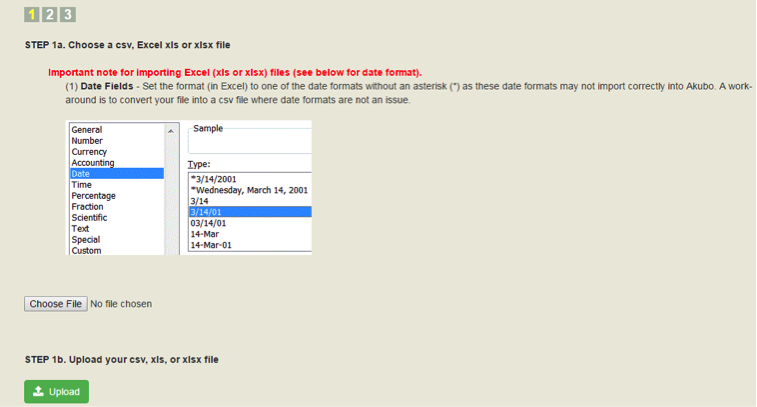 Below is a sample format of the Excel file. 1. On the main page of Akubo, click Others, then Import & Export. 2. 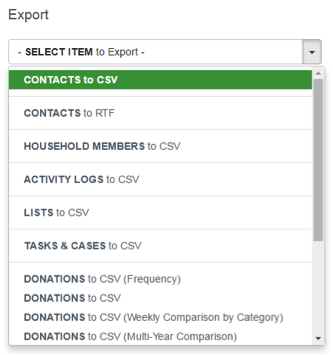 On the Import dropdown, select CONTACTS from Excel or CSV file. 3. Click Choose File to find the file from your computer that you want to import. Click Upload. 4. Next is matching the columns of the spreadsheet with columns in the database. The matched columns will be in green. If your file contains duplicate names, you can check on the setting that will not allow duplicates to be imported. 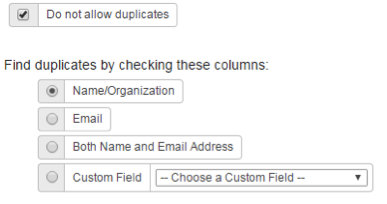 You have the option to check for duplicates by: Name/Organization, Email, Both Name and Email, or Custom Field. You can use the setting Assign Country to set a country value only if there are no other value in the Country column in the spreadsheet or if all the contacts are from the same country. If you want to add the new contacts to a specific group, you can use the setting GROUP: Add all imported entries to the group. From the drop-down menu, you can select an existing group or create a new one. If you’re cleaning your database, you can do an update import by exporting the contacts and after updating them in MS Excel, import it back to Akubo. 1. Export the contacts first. On the main page of Akubo, click Others, then Import & Export. 2. On the Export dropdown menu, select CONTACTS to CSV. 3. Select the contacts you want to export. You can select all contacts, by group or by individual contacts. 4. Next, select the fields you want to include in the exported file. Note: Don’t forget to check Contact ID. The Contact ID will help Akubo identify each contact when you do an update/import. 5. Click Create CSV File (MS Excel), then Export. 6. After editing the contacts in MS Excel, import it back to Akubo. On the Import & Export page, click on the link UPDATE CONTACTS using Excel or CSV file under the Import dropdown menu. 7. Click Choose File, and the select the file you wish to import. Then click Upload. 8. Next step is matching the columns of the spreadsheet with the columns in the database. Matched columns will be in green. 9. 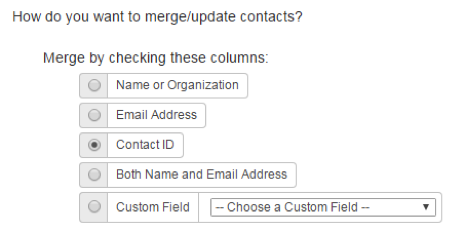 When merging/updating contacts, you can merge by the following options: Name/Organization, Email Address, Contact ID, Both Name and Email Address or by Custom Field. Note: When choosing the column to check for merging, it must have a unique value. Example is if you select email address then there should be no contact in the database that has the same email address listed on the spreadsheet. If there are duplicates, Akubo will not import the contact until the duplicate is removed. It is suggested that you use Contact ID since it is unique to each contact.